"In this life there are only two tragedies. One is not getting what one wants. The other is getting it." My first experience with British author Oscar Wilde was in middle school when, as part of a book project, I read The Picture of Dorian Gray. I can't remember how I came to select that book, but it was good, and certainly offered a detour from the usual school reading. It wasn't until years later that I learned more details about the infamous author and his somewhat scandalous life—at least by British standards of the late 1800s. It has always struck me that Wilde is upheld as a brilliant and imporant example of Western literature, yet during his own lifetime, he saw little in the way of gratitude. Although a celebrity and a national character for a good portion of his life, in his later years the public almost completely abandoned him and, basically, left him for dead because of his homosexual lifestyle. Thankfully, Wilde's position in the literary world has been restored over time, but the cloud of his supposed "scandal" still hangs over his work. When I began to watch Wilde, I feared that the film might take the route of examining only the gaudy, exaggerated aspects of the author's life and omit any portrait of the artist as a man. Thankfully, director Brian Gilbert and his team managed to take Oscar Wilde (as played by Stephen Fry)—as enormous a figure as he is—and create a film that bravely explores his controversial life. While gifted with the abilities of wit, wisdom, and writing, Wilde still was a human being, and a flawed one at that. In an interesting move, the film begins not with Wilde as a boy or writing his first book, but when he's already achieved a certain measure of fame. The focus is on his later years—his marriage and children—at the time he discovered that he was indeed homosexual. Although he managed to write several plays and books that were adoringly received by the public, the film makes the argument that perhaps, had it not been for his sudden affairs with men, he might not have written some his most memorable and perceptive works such as The Importance of Being Earnest and The Picture of Dorian Gray. His relationship with Alfred Douglas (Jude Law) is central to the themes of Wilde's love life, and ultimately it was that fateful relationship that landed him in prison. Like any screen biography, Wilde is not perfect. How can any one film truly encapsulate the personality of its subject in all its aspects? Here, director Gilbert seems to largely ignore Wilde's writing and celebrity, as well as the evolution of his personality, and focuses instead on those years when he was most controversial. This isn't a gimmick, however. Rather, it has the effect, for me, of showing Wilde as something other than a snobby, scoffing genius, but rather a man who, behind the scenes, wasn't quite as brilliant in his choices as he was at dispensing quips. I've heard criticism that the film is largely focused on his homosexual relationships, to which I say: so what? Many other biographies of great authors and personalities have lots of their affairs documented in great detail, yet they are portrayed as haunted and tortured. Is not Oscar Wilde, a man smitten with a foolish, arrogant, mean-spirited boy such as Alfred "Bosie" Douglas, in the same category? Yes, there is sexual content, but certainly no more than your average romance film. Performance-wise, the story comes alive thanks to the contributions of a capable cast. As the central character, Stephen Fry does a remarkabe job channeling the soul of Oscar Wilde, without the arrogance of thinking he can "do" Wilde. He recreates the spirit of the author without going into heavy mimicry or some stereotyped portrayal. Jude Law was an excellent choice for "Bosie" Douglas; able to be the charming angel one moment, instantly transforming into a troubled and angry person in his father's shadow. Tom Wilkinson (who is up for an Academy Award® as I write) portrays Bosie's father, the Marquess of Queensberry, the man who hounded and harassed the author until Wilde foolishly responded with legal action. As usual, Wilkinson manages to come across as a powerful adversary, and he functions very well. I would imagine he's portrayed a bit darker than he was in reality (one must remember, in the day, the Marquess would have been viewed by most people as a hero to go up against a "sodomite" like Wilde), but like many biopics, there has to be that villain there to drive the hero. The supporting cast is top notch and the immersion into Wilde's life is truly completed. Despite its flaws, Wilde is an engaging and interesting look at a man who, arguably, was only the image of modern sophistication and non-conformity, while inside struggled to be accepted as an ordinary person with ordinary challenges. It may not be 100% historically accurate, but the underlying themes and messages seem to outweigh precision in that respect. Wilde is the kind of self-possessed dramatic experience that seems to flow along on its own power, in which the presence of cast and crew is not apparent until the end credits roll. Image Transfer Review: Presented in 2:35:1 anamorphic widescreen, Wilde has a pleasing, theatrical look to it. Almost the entire film seems to have use a very wide angle lens that absorbs large amounts of scenery, yet accomplishes effective close-ups as well. The transfer suffers from some slight edge-enhancement problems that tend to ruin sharper details in bright scenes. In addition to this, there is some rather heavy grain in a few portions, but neither of these problems are fatal to the overall film. Otherwise, the transfer does not have any noticable artifacts or aliasing issues. Audio Transfer Review: The Dolby Surround audio is primarily based in the front channels, with little in the way of major activity. A few moments of dialogue seem muffled and hard to make out, but these instances are fleeting. The musical score is fairly subtle and, though stereo, never overpowers the sound effects or other crucial elements. Surround channels get very rare, occasional usage during some of the busier sequences, and while effective, it never goes overboard. Extras Review: Although Wilde doesn't seem to be overflowing with extra features, those here are high quality. There are two documentaries, both of which are extremely meaty, not in the least overly-promotional or 'fluffy.' The first, Simply Wilde, is primarily a lengthy (22-minute) interview with actor Stephen Fry in which he discusses elements of Oscar Wilde's life and how they fit them into the movie, and speculates on what they meant. While the director, producer, and writer do make appearances, Fry's thoughts are the highlight. There are a lot of clips from the film, but they seem relatively balanced with what is being discussed. The second feature, Still Wild about Wilde, runs at 55 minutes and is more of a making-of documentary. It covers the evolution of the film from genesis to funding to production. Numerous members of the cast and crew are interviewed, and there is a lot of behind-the-scenes footage. It's a very solid and well-made feature and it would seem that Wilde was meant to be, at least in part, somewhat speculative in its interpretations of Wilde's life. The combination of both documentaries provides an extremely in-depth look at the film and its sources. If that's enough for you, there's also a full-length commentary track, featuring producer Marc Samuleson, screenwriter Julian Mitchell, director Brian Gilbert, and actor Stephen Fry. Unlike the documentaries, the commentary is much more casual. The four men are live together on the track and get into all sorts of production anecdotes, revealing some of the more obscure bits of humor in the film. Stephen Fry seems an instinctive pick for the title role, as all through the commentary he makes little jibes and observations that seems rather 'Wildean.' The disc rounds off with a photo montage from the film, set to some of the soundtrack score. There are trailers for other films, as well as a DVD-ROM weblink to the official Wilde website (OscarWilde.com). The keepcase insert has some brief production notes. 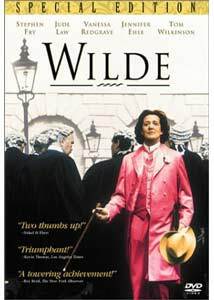 Wilde is a superb drama and one that examines the more private elements of a man who lived, in so many ways, publicly. The filmmaking is bold but also restrained, allowing the actors to truly take the story and make it their own. Stephen Fry, not usually the "star" of a film, certainly earns his numerous awards and nominations here. As he puts it, "Oscar Wilde was not a professional homosexual, and Oscar's love for his wife and children was absolute. To some that may seem rather odd—'people should be seen to be one thing or the other'—but the film takes a more complex and realistic view."